10 Ajaw 3 Kumk’u. Drawing by Jorge Pérez de Lara. 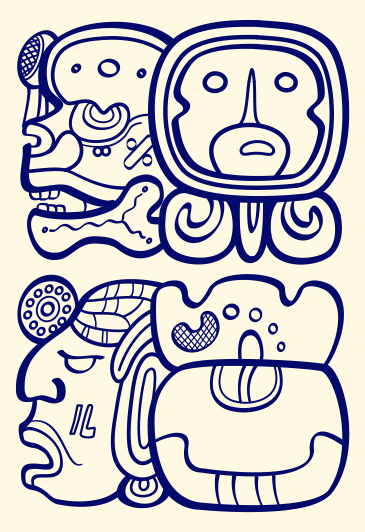 A New Curriculum—Teaching Maya History, Calendrics and Writing in Cobán, Alta Verapaz, Guatemala. We are happy to report that we received many applications for our latest round of mini-grants! As we review the applications and make our final decisions, we wanted to continue to publish the reports from the good work of some of our previous recipients. This month, we publish a report from Marina Rosales López and Mario Sebastián Caal Jucub, who led a colorful, introductory workshop last October on Maya writing and calendrics in Cobán, Alta Verapaz, Guatemala. The workshop was designed for Q’eqchi’ y Poqomchi’ teachers and graduates of the Magisterio de Educación Infantil Bilingüe Intercultural. We are very grateful to be able to support the work of these dedicated teachers who are doing the important work of bringing a deeper appreciation and understanding of Maya history, writing, and calendrics into the national curriculum in Guatemala. In our upcoming blog on April 19, we will be announcing the next recipients of this year’s mini-grants. Please stay tuned! Report on the Introductory Level Epigraphy Workshop, October 14, 2016, Cobán, Alta Verapaz, Guatemala. Name of the event: “Induction on the History, Calendar and Ancient Mayan Writing” aimed at teachers and undergraduates of Magisterio de Educación Infantil Bilingüe Intercultural. Date: October 14, 2016, (waqib ‘Aj).